Jimmy the Gun: Ford F-150……….OUT! I priced out the truck (an F-150) I’d like to have. I built it on Ford’s website. The problem is the $37,125.00 price tag I came up with. OUCH! Of course, the smart thing to do is buy used. The problem is the used Ford F-150’s are usually beat up from being used as work trucks. Also, I want the four door version but I don’t like the 5 ½’ bed. The 6 ½’ bed came out this year but you can’t find used ones that new. I’m also not really sure that’s the best purchase. We keep talking about SUVs vs trucks. The SUV would be great for hauling our son and his 2 cousins. The truck would be great because then we would have the ability to go to the dump, take our Christmas Tree to the pile in Lincoln, help move big objects to and from KidsPark, etc. …I just realized I don’t really have a lot of needs for a truck. All the examples I just listed are don't really come up that often. I just would like one because I like trucks. Wow. I just made up my mind that a truck is not the right purchase. In the codes we use at work…10-22 (disregard) this entry. Watch for one on the SUV I would like to purchase. 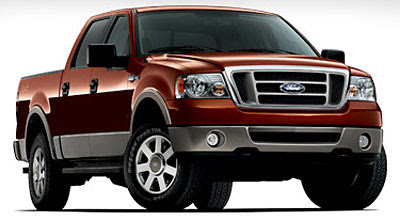 Also, the picture is the the King Ranch edition. This is not the model I priced out. It is nice though.